TALLAHASSEE -- With homeowners still feeling the pinch of high premiums despite the Legislature's promises in January to cut rates, Gov. 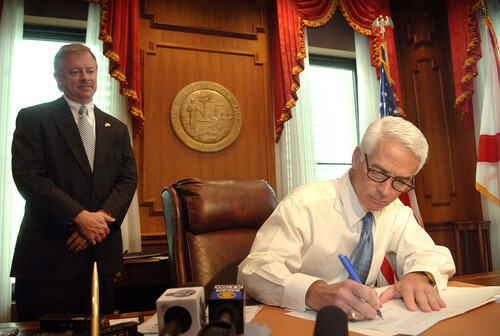 Charlie Crist made a rare, personal appeal to lawmakers Monday not to lose sight of the property-insurance crisis. At a Senate Banking and Insurance Committee packed with insurance-industry lobbyists, Crist spoke for a bill that could send more business to Florida's state-run insurance company. It was the first time a governor has testified at a legislative hearing in nearly a decade, and the meeting came to a brief but heated standoff between Crist and insurance lobbyists. With the committee's agenda packed and time running out, senators finally voted 8-1 to approve the bill after amending it to allow consumers to pick Citizens Property Insurance Corp. if the best offer they get from a private insurer is at least 15 percent higher than Citizens' quoted rate. market at any price, keeping it out of direct competition with private companies. The bill (SB 2498) also would carry out a Crist campaign promise to prohibit private insurance companies from establishing Florida-only subsidiaries. Crist has derided the subsidiaries as a means for insurers to ship their profits out of the state while also charging Floridians exorbitant rates. The bill must clear two more Senate committees before it can go to a full Senate vote. A similar House bill on the issue has yet to be heard. Before the vote, State Farm Mutual lobbyist Mark Delegal warned that the changes were "ill advised" and would "turn on its head the actuarial science that's used in all lines of insurance" throughout the country. Crist, who has openly battled with insurance companies for months in a push to lower rates, jumped at Delegal's rhetorical bait. "It does turn things on its head," Crist said. "It gives more power back to the people. It gives the opportunity for [competition] to get lower rates." Crist sought the changes during the January special session on insurance but was thwarted by opposition led by House Speaker Marco Rubio, R-West Miami. William Stander, a lobbyist for the Property Casualty Insurers Association of America, blasted the legislation, saying it would drive existing insurers out of the state, make it harder for new insurers to start up in Florida and expand existing inequities in how insurance is priced in Florida. Floridians who don't live in areas at great risk of hurricane damage, he said, will pay even more, to subsidize the insurance costs for people who live in riskier locations. "It's unfair," Stander said. "The rates for those in Citizens, who live in those places more at risk of damage, like South Florida and condominiums near the water, are being kept artificially low. But the [damage] risk remains. When storms come, Citizens will have to issue assessments." Assessments by Citizens, Stander noted, are applied to almost all insurance policies in Florida, including auto insurance and commercial liability coverage. The last time a governor testified at a legislative hearing was in 1998 when Democratic Gov. Lawton Chiles spoke to a committee headed by then-state Sen. Charlie Crist. The issue then was how the state intended to spend a major lawsuit settlement with tobacco companies.